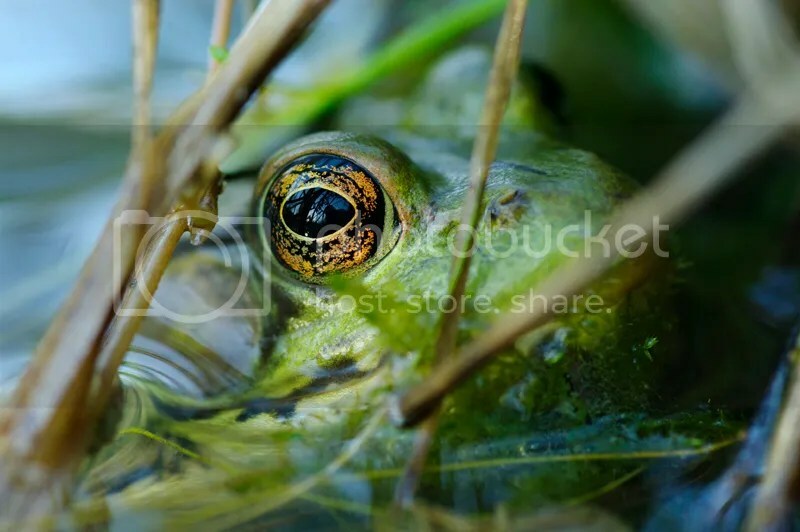 When i first arrive at a pond i get down on my knees and and i scan the surface of the water to spot the frogs hiding in the vegetation, often there is one or more frog close to me that i didn’t saw right away. Here is an example of a frog that was hiding in the vegetation just at my feet, i had to use my camera handheld to get as close to the water as possible. Pentax K20D, Pentax DFA100mm Macro WR. Now that i found them i look at my options, if the frog that is farther on the pond offers the best composition i will use my 400mm with extension tubes (if necessary) to get the shot. It’s easier to use a long lens since you don’t have to get as close to the frogs, some will be more tolerant to you and your camera, green frogs and Bullfrogs are quite tolerant in general while Leopard frogs are harder to get close… habitually they just jump away, you just have to be patient and find the right one. When they jump into the water for safety frogs will often came out approximately in the same place, if you wait a little they will came back. Getting low and moving slowly is the way to go if you want to get close to a frog with shorter lenses, especially if you want to photograph them with a wide angle lens. Even if you’re using a 100mm Macro lens and you want to fill most of the frame with a frog you will need to be quite close. I tried AF and MF and i prefer MF to get accurate focus on the eyes, because they have big eyes the AF target can miss the appropriate part that you want to be sharp on your final photo. Now i have a Pentax K-01 which is a mirrorless camera with a great focus peaking feature that make getting the exact focus very easy and i also can get shots that i was not able to get with a DSLR because i don’t need to look in a viewfinder now. This shot was made easier because i was using the Pentax K-01 (a mirrorless camera) which have a great focus peaking feature to help manual focusing. Since i didn’t need to look in a VF i was able to take this photo at arms length just above the water surface, the Shake Reduction made it easy to have a sharp shot. Having the right tools for the job makes it fun and easier. BTW you can see that the frog have a little friend on her nose. Pentax K-01 with Pentax DFA 100mm Macro WR. Frogs live in wet environment here in Canada, so most of your frogs photos will have water in it. The classic composition is a frog head coming out of the water, there is nothing wrong with that. 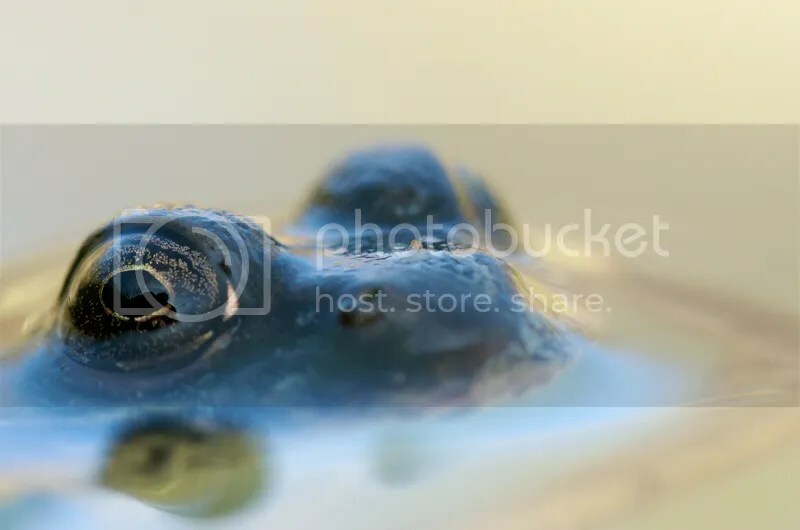 The best way is to get as close as possible to the water level to have a frog’s view, if you can have reflection of a colorful background it will help, in that position you will see those big eyes reflected on the water surface. Variation in your portfolio is a good idea, try different view and lenses to give dynamism to your shots. Like this shot here, i took it from above and only one side to create a different view and showing the frog from another angle. Pentax K-01 with Pentax DFA 100mm Macro WR. 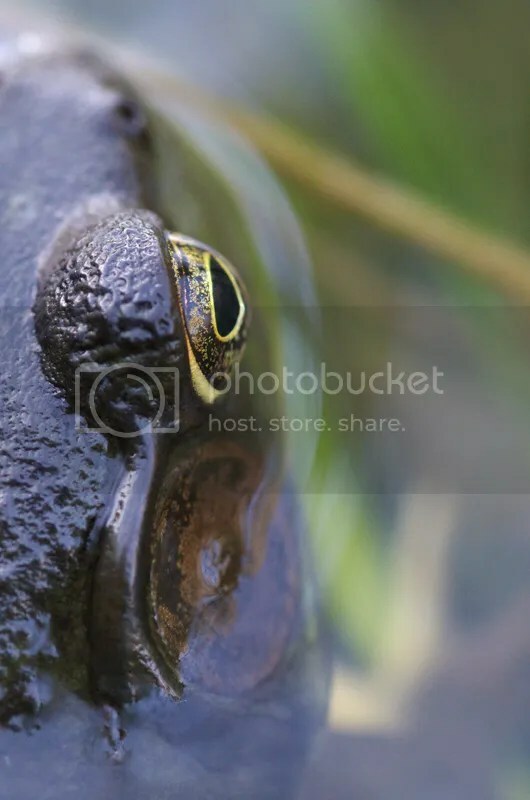 When i can i will use a wide angle lens to show the frog in it’s habitat, it’s not easy to do because you have to be very close to the frog, i’m using a 14mm lens on APS-C cameras, so the front of the lens is nearly touching my subject! I’m trying this only when i see that a frog is very tolerant to my presence and that she will accept me to get so close. In that shot i was able to get close to those frogs (they were at least 6 close to me ), by using my 14mm i can show them in their habitat. Pentax K20D with Pentax DA14mm. I also like to go to different ponds where i can found other species, i have two places where there is a lot of green frogs and even Bullfrogs, i also go to a beaver’s pond where there is Leopard frogs, Spring peeper frogs and Gray Tree frogs that can be photograph on the land and tree (except the Leopard frog) which makes a variety from the shots of frogs in the water. 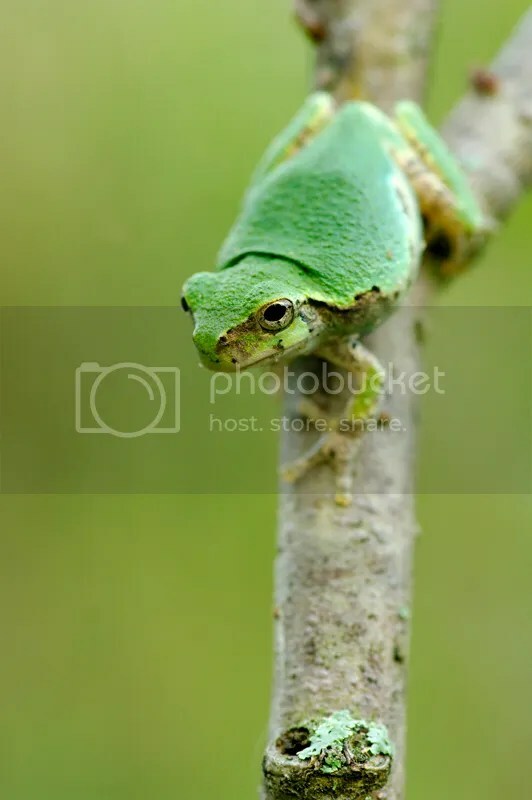 Above is a shot of a Gray tree frog, they are so fun to photograph because they can take different positions and move in their environment, it gives you great photo opportunities. Pentax K20D with Pentax DFA100mm Macro WR. 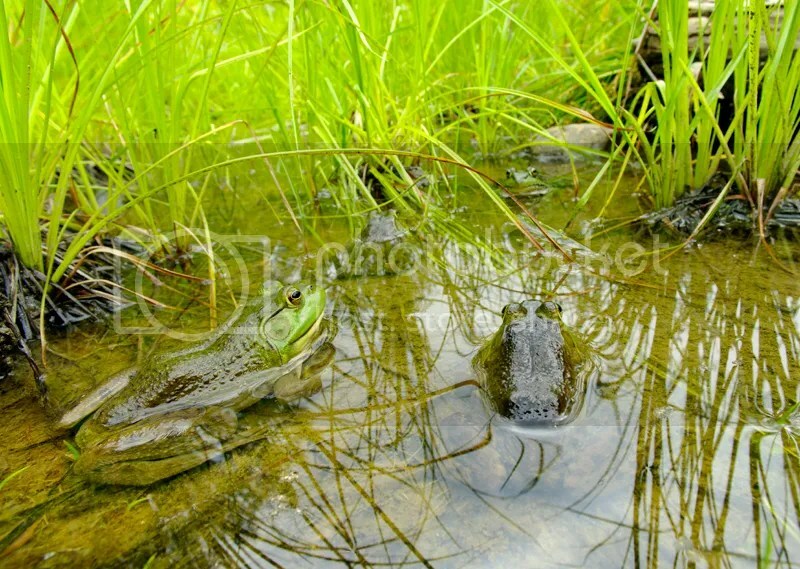 Green frog and Bullfrog are often found in the water or close to it so they can jump in the water for safety. Gray tree frog, spring peeper frog and Leopard frog can be found close to water but also farther away, they don’t necessarily jump immediately for safety. The Leopard frog is very quick and try to hide in the vegetation and can also jump in the water while the tree frog will climb in a tree but i found them quite tolerant in general. In the forest you can also find the Wood frog and the American toad (this one lives in a variety of habitat), they can be hard to spot because they can be very well camouflaged if they don’t move. The toads are not very fast, when they try to escape i just put my hand in front of them and they stop , then i have time to take some photos. 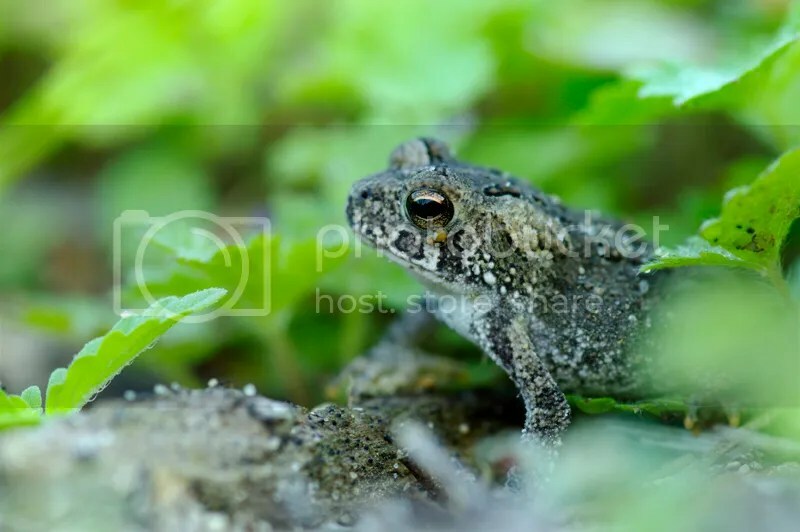 This young toad above was taken on the sandy shore of a pond, he is quite small, i braced my lens on a bean bag on the ground to get to it’s level. Pentax K20D with Pentax DFA100mm Macro WR. Since i prefer to photograph frogs early or late in the day, then the light on my subjects is often flat, it’s good because it shows all the details of the frogs. But it’s also good to have some frogs lit by the sun, the frogs skin can be very reflective and it can be hard to have a great photo when the sun hits them directly because of the high contrast. Having a soft directional light is more effective and less contrasty, so if you can have that in your shot it will improve it without blown out highlights. You will need rubber boots with rain gear or waders to get down and stay dry in the wet and muddy shores of the ponds, because you will get wet and dirty. If you want to get close to the ground with your equipment a tripod that can get low or a bean bag will be helpful, i also use swimming aids for kids that i can inflate to the right firmness to support my lens. As for the lenses, i have used lenses from 14mm up to my 400mm to get photos, just use the one that you need to do the job. Like i said earlier, i now also have a Pentax K-01 that is great for shooting at ground or water level with it’s big LCD, live view and focus peaking feature. Having a stabilized lens or in-body stabilization is very helpful when you need to handheld your camera, it’s a feature that i really like now as well as the high ISO performance of the newer camera. Hope you will appreciate the frogs and give it a try at photographing them, they are very important and they are in danger as well as their habitats, so we have to protect them.